A big thank you to everyone that supported the Village Easter Egg Hunt, in total we had over 300 young people, parents, friends, families and even dogs taking part! Three routes kept people busy around the rec, an intriguing village quiz route and a more challenging orienteering course for the adventurous (and mud loving) folks! 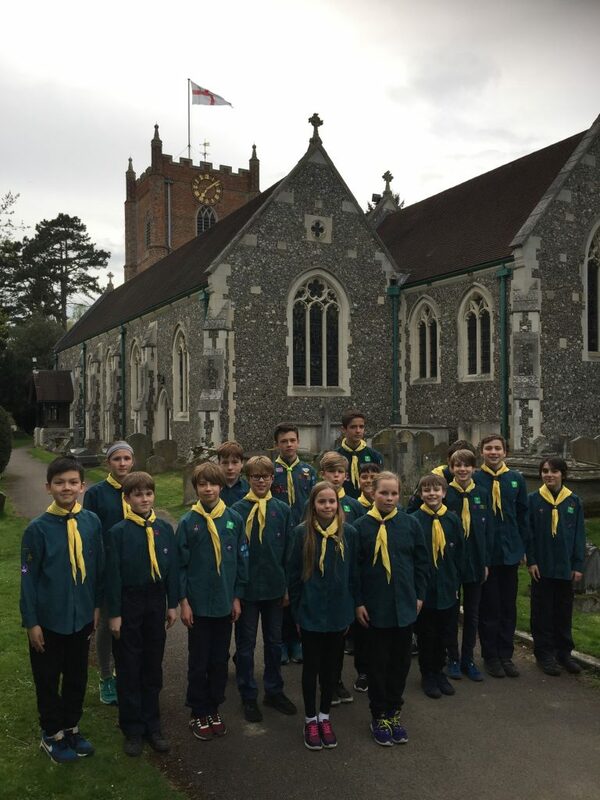 Along with the Fireworks, 10K water-stations and the Remembrance Sunday Parade, this is another event where Beavers, Cubs, Scouts, Leaders and our Exec Committee support the village. We look forward to welcoming the young boys and girls who may have visited the Scout Hut for the first time into Beavers or Cubs. After Easter, the Patrol Leaders and their Assistants completed one of the tasks for the Team Leader Challenge Badge by teaching scouts (and leaders!) how to tie various knots including the rolling hitch, double fisherman’s, clove hitch, bowline, sheet bend and sheet shank. Being able to tie knots is actually a useful adult skill whether you are half way up a mountain or in the garden. Summer is finally here, and we are all looking forward to making the most of the warm sunny Monday evenings. We started the term off with a trip to Bowsey Woods to cook sausages and toasted marshmallow digestive biscuit sandwiches (a tasty favourite), as well as playing some wide games! 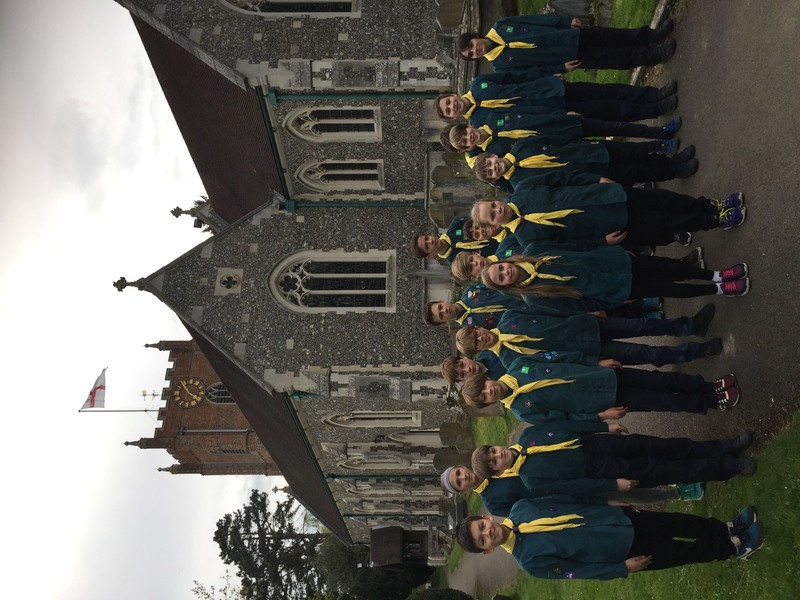 A highlight of the Summer term term so far was definitely our trip to St. Mary’s Church on Mill Green to learn about bell ringing. This was organised by our Assistant Group Scout Leader Bill Bookless for Monday 23rd April which was St. George’s Day. What an honour it was to ring the village bells! Firstly, our apologies for the noise pollution that evening, we were of course not very good at it! We really appreciated the patience, expert skill, advice and friendliness of John Coombes, Vinni Sullivan, Anne-Marie Adams and Bill. 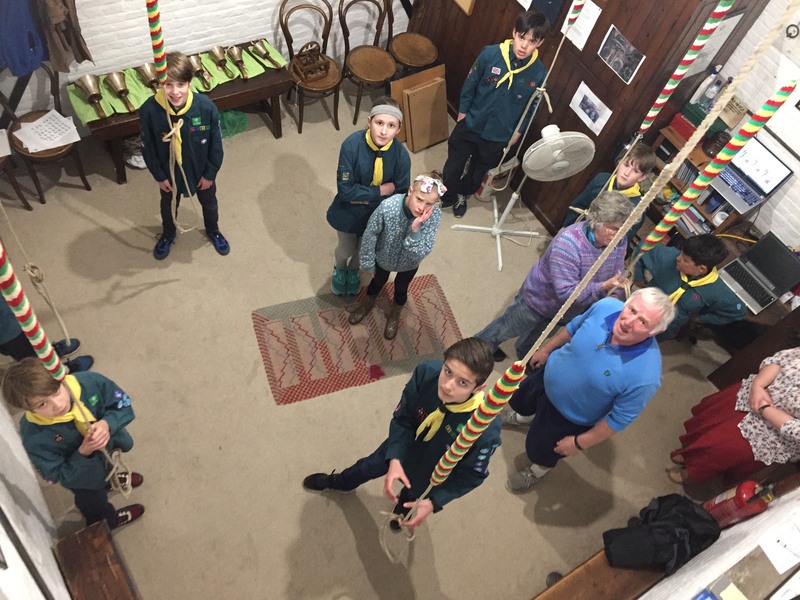 The scouts enjoyed climbing up the various steps and two sets of ladders to ring and then view the 8 bells. They learnt about their history – from being cast in 1915 to the present day. The scouts were particularly intrigued by the miniature “silent bells”. During WW2 all church bells were silenced to be only rung if there was an invasion. The tiny silent bells enabled Wargrave’s bell ringers to continue to practise during the war years. On the 11th November of this year the main church bells will be ringing again to mark the WW1 Armistice Centenary. Scouts have lots of fun activities planned for the rest of the term including one-pot cooking, a night hike, orienteering and dragoon boat racing on the river. If you would like to know more about Beavers (Wednesday 6-8 years), Cubs (Tuesday & Thursdays 8-10.5 years) or Scouts (Mondays 10.5-15 years) please contact Pete Fry our Group Scout Leader (gsl@wargravescouts.org). We always welcome volunteer leaders to help run our sections and also new trustees to join our Exec Committee which organises social events and maintains our charity finances. If you are interested in providing young Wargravians with the opportunity to experience the outdoors and help them grow and develop life-long skills, please do get in touch, it’s a very rewarding way to give back to our village community.